It’s coming up to our three year wedding anniversary (December 11th) so what does working wanderlusts, who were married in Dubai and honeymooned in the Seychelles, do to celebrate? Well, we’re not topping those two exotic destinations, but we have planned a romantic trip to Hawaii. It will be our third Hawaiian island to conquer, having done vibrant Oahu many moons ago and idyllic Kauai last year. So we thought it was high time to check out the Island of Hawaii in all her magnificent glory. 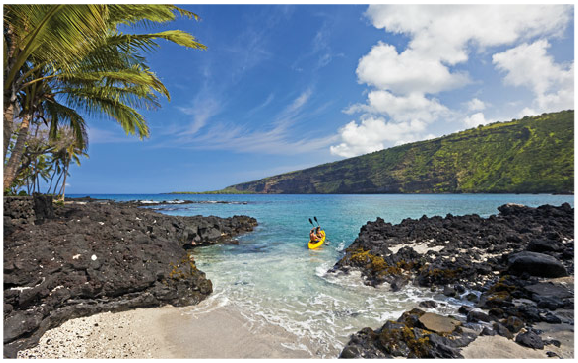 To avoid confusion with the name of the entire state, the Island of Hawaii is often called the “Big Island”, and what an appropriate name it is. Nearly twice as big as all of the other Hawaiian Islands combined, its sheer size can be inspiring. So large in fact, that you’ll find all but two of the world’s climatic zones within the island’s shores. The Official Hawaiian Tourism Authority has been incredibly helpful in recommending and arranging activities, while Sheraton Keauhou Bay Resort & Spa will be graciously hosting us at Kai, the resort’s fine dining restaurant. We’re in for a prime dining setting with expansive views of serene Keauhou Bay and the Kona Coastline. We have also been kindly invited by the Sheraton to attend Haleo as their guests. Haleo is their spectacular dinner and luau show: In a magical setting beneath the stars, we’ll savor traditional Hawaiian foods and as the sun sets, we’ll be captivated by traditional music and dance. As you can imagine, we’re very much looking forward to our upcoming trip!